This re-release on Medici Arts of La Scala's Adriana Lecouvreur from the 1999-2000 season – it appeared originally on Euroarts – is indicative of a renewed interest in Francesco Cilea's most famous opera. The recently acclaimed performances by the Chelsea Opera Group, together with the current Met revival and the Royal Opera House production scheduled in the coming season, suggests that there's a lot to be unveiled about this once-famous work. The meta-theatrical connotations are perhaps Adriana's most intriguing characteristic: actors from the Comédie Française are portrayed staging Racine's tragedies to a fictional Parisian public, while political and sentimental deceptions take place behind the scenes. In this production, first seen in 1989 and directed by Lamberto Puggelli, Daniela Dessì features in the title role. 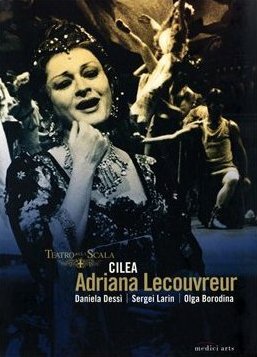 Her Adriana is confident and passionate as an actress but reveals a timid personality when not performing: despite representing a charismatic woman for her fellow actors, she is overwhelmed by her love for Maurizio, to the point of abandoning her company when she believes she is no longer loved. Dessì's singing is boldest when her character is acting: when she attacks her rival, the Princess of Bouillon, by means of lines from Racine's Phèdre ('Le audacissime impure, cui gioia è tradir'; 'Those brazen, unchaste creatures whose joy is to betray'); or when she sings her final aria, insanely trapped in the character of Melpomene, the muse of tragedy. Puggelli's filmic direction is effective in underlining Dessì's elegance. In Act II, when Adriana darkens the room in order to let the Princess flee, the camera dances around her as she blows out the chandeliers' candles. The suavity of the camera work and of Dessì's acting make this sequence, accompanied by a long and warm orchestral intervention, a memorable one. This production succeeds in exploiting the multiple dramatic levels without making the resulting sense of artificiality suffocating. This is mainly due to Paolo Bregni's set design, in which the back of the stage is a glass wall that allows the actual audience in the theatre to see another theatre and another stage on which the Comédie's actors perform. An exemplary moment is Adriana's monologue on the mirrored stage. The audience can see her performing, yet cannot hear her soliloquy; instead, on the actual stage, we are presented with a solo by baritone Carlo Guelfi who, as the melancholic Comédie director Michonnet, expresses his tender fondness for Adriana: he knows he cannot love her more than as a daughter, since she is in love with Maurizio. Guelfi's Michonnet is the most convincing male character in a production vocally dominated by women. Sergei Larin as Maurizio is not completely satisfying as the object of both the Princess's and Adriana's desire. His singing is clean but not particularly expressive, and the frequent camera close-ups don't hide a certain flatness of dramatic interpretation. On the other hand, mezzo-soprano Olga Borodina makes the Princess of Bouillon an imperious adversary. Her entrance aria at the beginning of Act II advertises her authority, as she enunciates her first words with eloquent assertiveness: 'Acerba voluttà, dolce tortura, lentissima agonia, rapida offesa' ('Bitter voluptuousness, sweet torture, slow agony, sudden offence'), she sings with a hysterical pace and register, which faultlessly expresses the Princess's forthrightness. Besides meta-theatrical aspects, Bregni's conception of Adriana exploits the possibilities of a parallelism between the French neoclassical tradition, epitomized by the Comédie Française (passages from Phèdre and Bajazet are played and sung), and the reliance on a staging that owes much to neoclassical architecture. A climax of statuesque classicism takes place in Act IV: Adriana and Maurizio are finally reunited, and lie on a white bed at the centre of the stage. A wide shot encloses the entire set, which is composed only of the bed, and a mirror image of two Greek columns, two desks and a white transparent curtain as a background. This architectural construction draws attention to the overwhelming painterly quality of the scene. The set, then, remains especially important even when transferred to DVD format; it is only in one prolonged sequence that camera close-ups becomes so invasive that the rest of the scene loses its significance. This is the 'Poveri fiori' aria, when the screen is completely absorbed by Dessì's lament to the violets she has been given, whose symbolic value is one of death – they have been secretly poisoned by the Princess. Dessì's intimate tone and technical precision are poignant, and in this moment of vulnerability she sets the seal on her vocal importance. The final duet between Adriana and Michonnet confirms this couple as the most effective in conveying Cilea's tragedy: their singing is tender and desperate at the same time. The orchestra, directed by Roberto Rizzi Brignoli, is not always equally passionate; yet it is polished and at times warmly animated, perhaps especially in the Act II intermezzo. Physically absent from the last act, Borodina's Princess is still present in directing the liaisons dangereuses woven into Cilea's world. We are though reminded that this is a celebration of Adriana's art by an eloquent frame: in most of the scenes, and significantly at the end of each act, wide shots always show Adriana at the centre of the stage – her figure geometrically framed by mirror curtains and columns. This La Scala production demonstrates that Adriana Lecouvreur is an opera that can stimulate intelligent readings and passionate interpretations. Dessì, Borodina and Guelfi confer vocal depth; Mario Bolognese as Abbé of Chazeuil and Giorgio Giuseppini as the Prince of Bouillon convincingly sustain their roles, although other secondary characters are not always up to their level. The technical quality of this DVD is not first class, its booklet is not entirely informative, and there are no bonus features. Yet, I would nevertheless recommend it for outstanding interpretations, a thought-provoking staging, and for the possibilities it offers of becoming acquainted with such an inspiring opera.